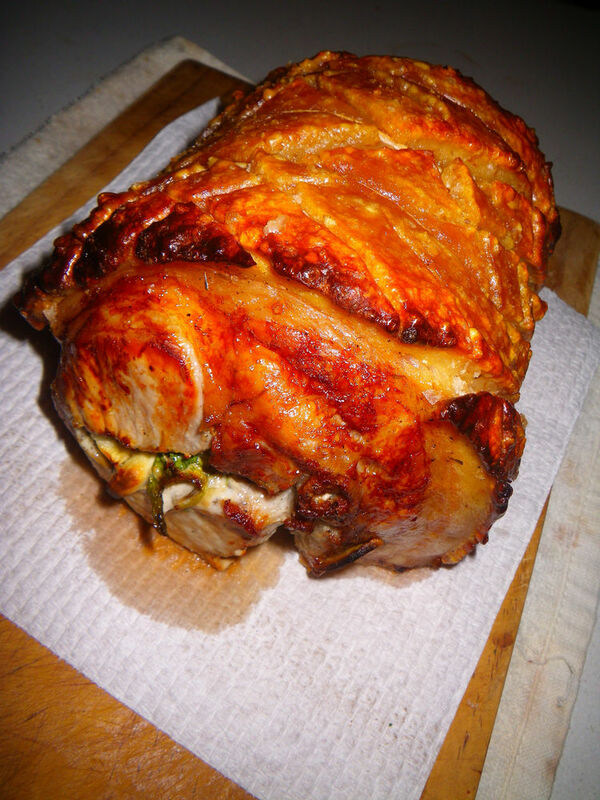 A couple of days ago, I wrote about the “simply delicious” Murray Valley Pork roast, a ready to cook product. 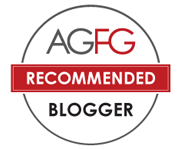 Please follow me today to explore another product, rolled pork loin, from this wonderful pork expert. 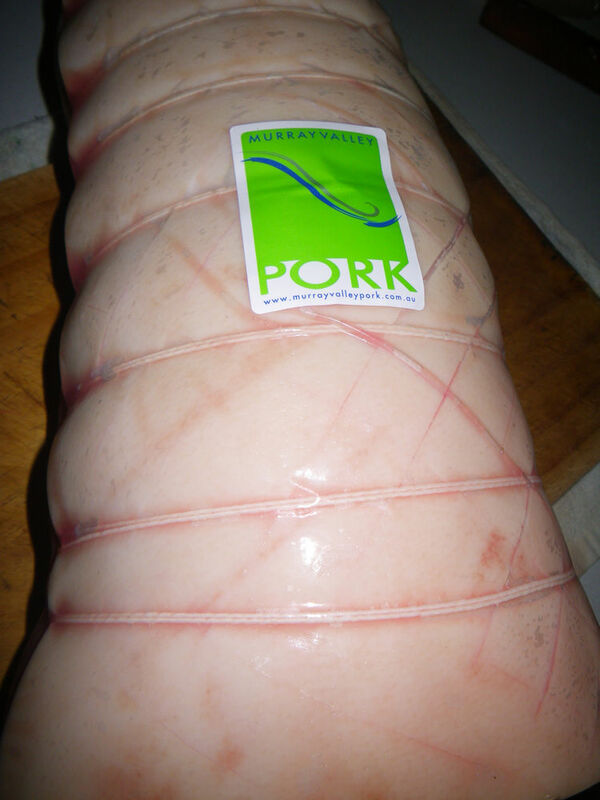 The product came in rolled and scored to take the hassle out of cooking pork loin. In the recipe today, only half of the product was used and the other half was utilised in a famous Taiwanese national dish, LuRouFan, which will be on the blog soon. After had a rough look at the pork, I was able to see a layer of thin skins on the outside with a moderate layer of fat between the meat and the skin. This is especially good in making roast pork to create beautifully crackled skins. Before even getting started on the cooking process, I know my pork was going to be nice. Look at the pink meat! The marbling was good, right? 1. 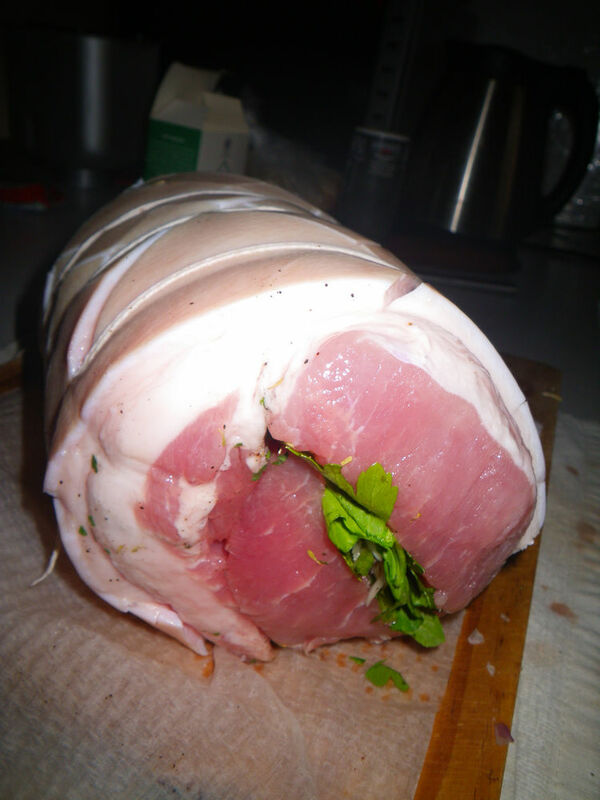 Unroll the pork loin and make sure it’s completely opened up. The internal surface was not flat, but I shredded some pieces off and made a smoother and flatter surface. 2. Season the meat well with sea salt and pepper. Make sure you add enough of the seasonings to give a better taste after cooking. Then, in the center of the portion, randomly spread the sliced garlic, diced onion, dried rosemary and fresh celery leaves. 3. 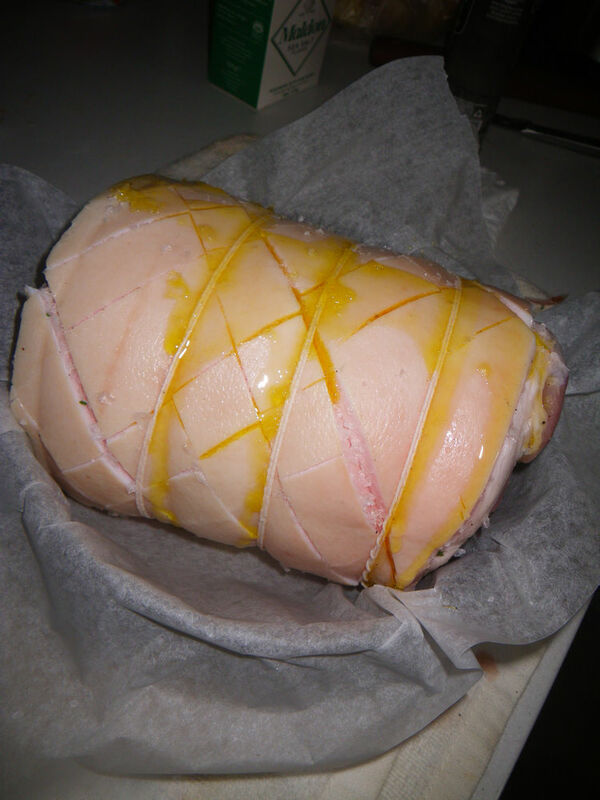 Roll the pork back to its original shape and tie it well. 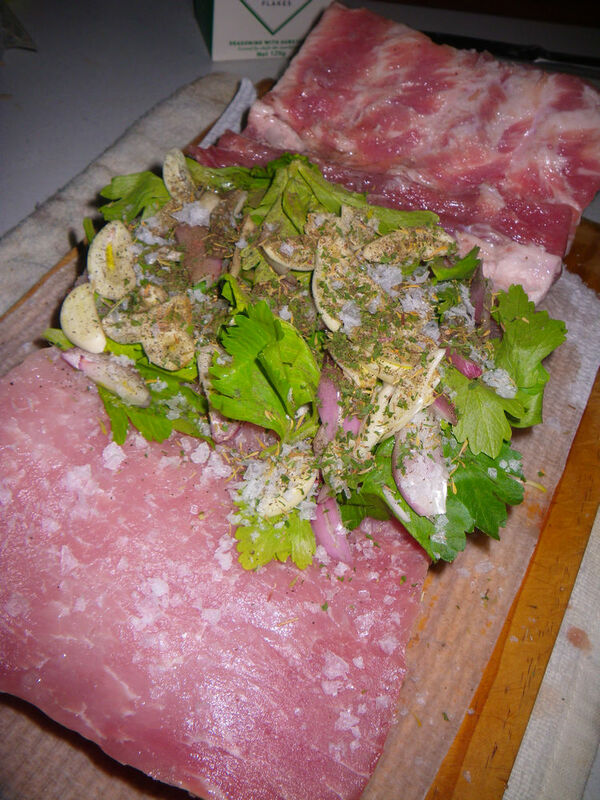 On the skin of the pork, rub in extra amounts of sea salt flakes and spread some extra virgin olive oil. 4. 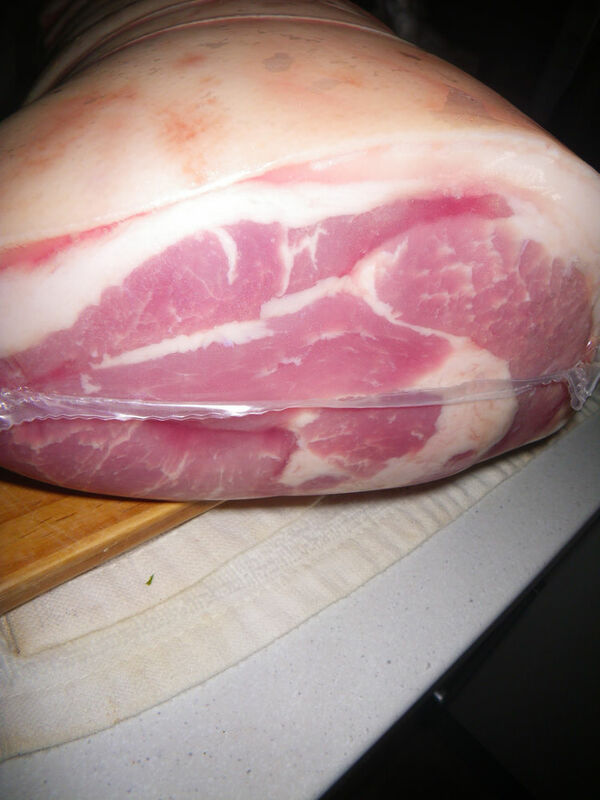 Roast the pork in a tray in a preheated 150 oC oven for 35 minutes until the skin is well crackled. The time may vary depending on the oven you used. 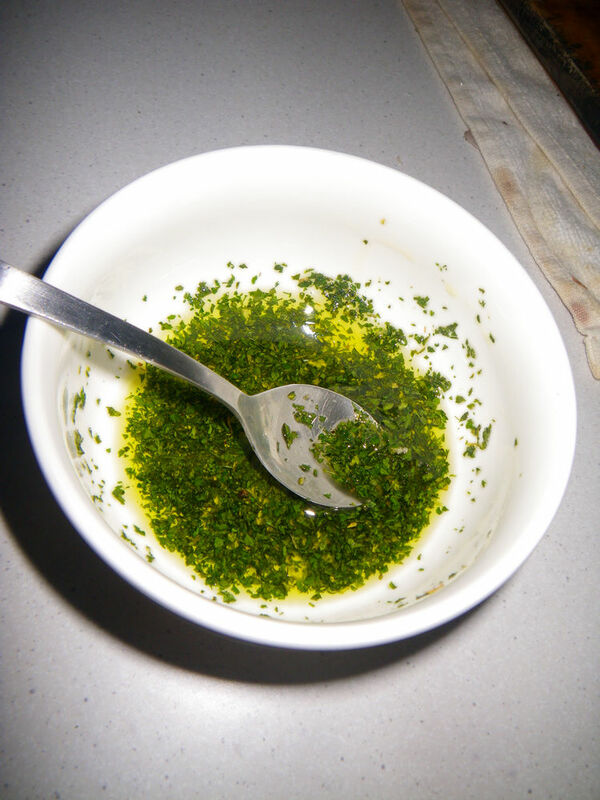 Meanwhile, immerse the finely chopped parsley in a thick volume of extra virgin olive oil and add a pinch of sea salt. Mix well and set aside. 5. After roasting for 35-40 mins and the skin looks golden crispy, take the pork loin out of the oven and rest for a further 5 mins before cutting. The pork should be very juicy. When pressed, some juices may run out. 6. Slice a thick piece of the pork and place in a plate. Spread over some of the parsley infused oil and serve. This dish was very easy to make and people can easily enjoy some good crackled skins in their kitchen. The meat was unbelievably tender and juicy and almost gave an explosion after each bite. 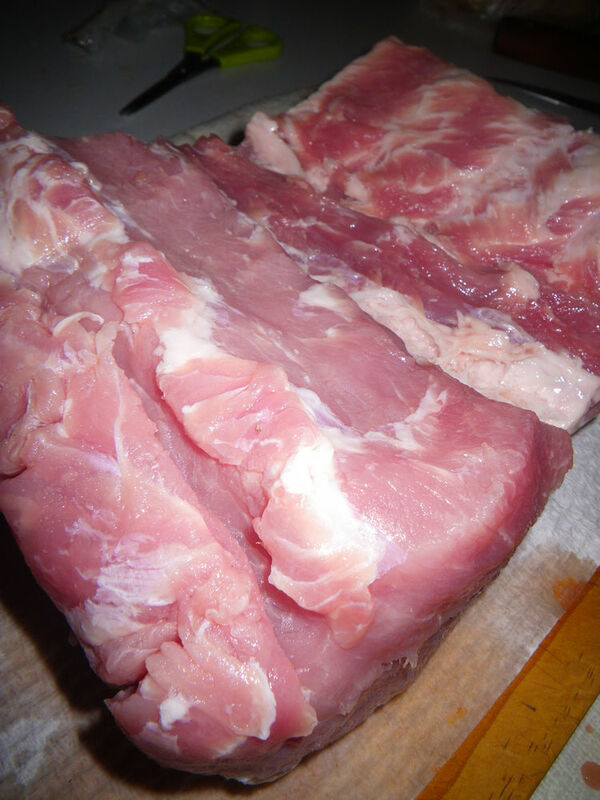 This may be caused by the correct amount of fat content of the pork. Since the skin was quite thin, after cooking, it was perfectly crispy and was easy to bite. The fatty part of the pork loin melt in the mouth straight away but I did not feel any oiliness. 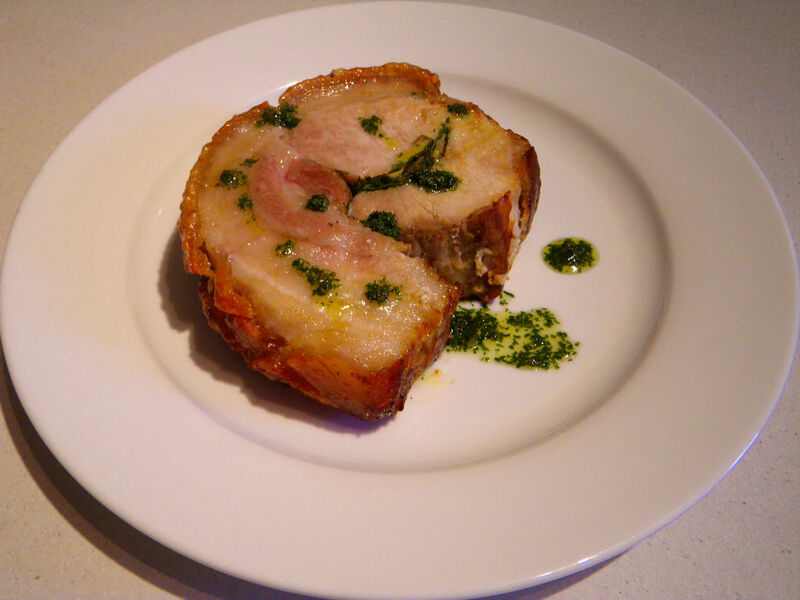 The dish was well seasoned and the meat was fully infused with the distinctive parsley flavour along with garlic and rosemary tastes. Some steamed vegetables or pickled refreshments can be a good complement too. G’day! I’m not a big pork fan, but your photo and recipe look delish Xin! YUM! 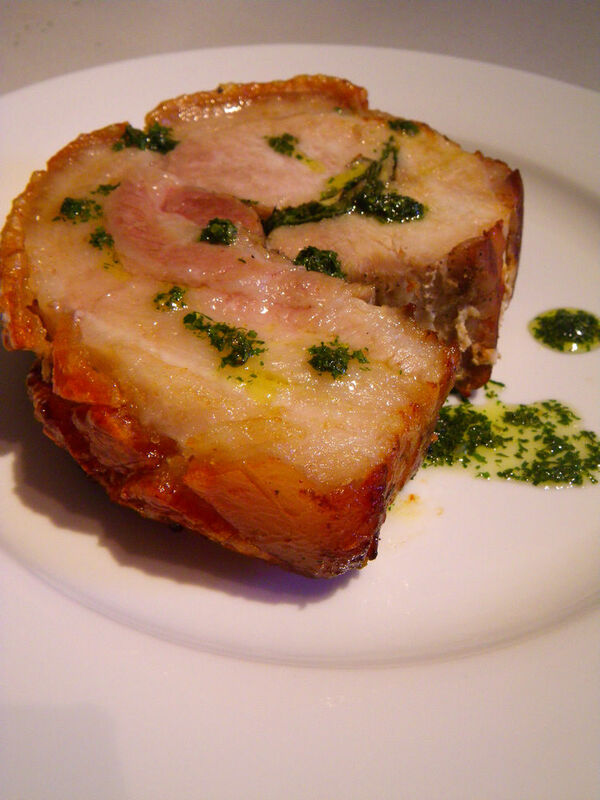 Such a wonderful pork loin dish, indeed. Looks amazing mate! Mum used to cook something like this! My family is a genuine lover of everything pork. Thanks for sharing. This is a dish I going to prepare for my next party! Thanks for sharing. Great! Please let me know how you go with the dish.